In honor of my 'baby' who is now 18 and is moving out of the house and into her new dorm room at college on the other side of the state, today's post is for a deliciously simply and moist chocolate cake with a marshmallowy Seven Minute Frosting to top it off. I used a pre-packaged European Chocolate Mousse that mixes with milk just like pudding to pull together a cake that looks like you slaved away all day on it. The reason I am choosing this recipe in honor of my daughter's move to college today is that when she was 8 years old she secretly made this cake for my husband and I, from scratch, while we were out to dinner for our 11th wedding Anniversary. Our neighbor was babysitting for the three children in her home across the street and my daughter convinced her that we allowed her to bake in our home 'all the time' (truth: never) so my friend let her go back home to make us a surprise cake. Just a second grader, she baked her first cake, from scratch, all by herself and even found a frosting recipe in my cookbooks and made tinted frostings to decorate it. Mix the dry ingredients in a bowl. Add the water, vanilla and mayonnaise. Beat 100 strokes with a wooden spoon until smooth. Grease 2 - 8" layer pans, line the bottoms with wax paper and pour half the batter in each. Bake at 350 degree's for 25-35 minutes until done. Cool in pans 5 minutes before turning out to cool completely. I like to freeze the layers which makes it easy to assemble the cake later. For the center use frosting, mousse, or even a light layer of raspberry or cherry jam. Another delicious filling we've used is hot fudge sauce. I used a Seven (7) Minute Frosting for the top but you can use your favorite frosting. Our oldest daughter will soon be leaving for college and because she balked and put off having her wisdom teeth taken out last Christmas because she didn't want to recover during break, and the Spring because of Spring Break, and in April because of prom and May because of graduation... she ended up having surgery last week. Her wisdom teeth were buried deep and hadn't started moving yet, but due to her braces, her tiny mouth and a history of her permanent teeth coming in at difficult angles, her orthodontist and her dentists wanted to get all four removed. It's in honor her and her week of pain, swelling, bruising and inability to eat that I'm posting the first 'real' food she had in three days; Vegetable Cheese Soup. The 'cheese' part for her, the 'vegetables' for me... because I'm a Mom. This is one of those recipes where you start with a basic idea and then you add to it and turn it into what you want. I preach this often but I mean it... use a recipe as a GUIDE and make it your own. Play with your food! Add what you want, leave out what you don't like. In a saucepan melt 2 T butter. I like to add about 1/2 - 3/4 cup water and cook onion, carrot and green pepper over medium heat until tender. Remove all from saucepan. At this point you can put the vegetable mixture into the blender or a food processor and process until smooth or you can leave them diced for a nice texture. Melt 2 T butter, stir in flour and cook 2 minutes while stirring or whisking smooth. Gradually add the broth and cream. Whisk, increase heat and bring to a very brief boil. Reduce heat immediately and simmer on low 10 minutes until thick and creamy. Add the mixture of cheeses and the cooked veggies. Serve! * You can leave out the cheese, you can leave out the vegetables if you like. You can add jalapeno's or spinach or even cooked asparagus. Another delicious version I've made with this base is a red pepper and shrimp bisque. Play with your food! Southern Living comes through again! It's 5:00 pm, I just got home from work and I'm wondering what to make for dinner. Checking my email I see this delicious looking (and sounding) recipe from them and yet again am totally in love with their magazine. I do believe that when I finally get back down to the South and call it 'home' again I am just going to stack up my magazines and systematically go through and make every single recipe them. They never let me down. Soak wooden skewers in water to cover 30 minutes. Cook green beans in boiling salted water to cover 4 minutes or until crisp-tender; drain. Plunge into ice water to stop the cooking process; drain, pat dry, and place in a large bowl. Combine shrimp and 3/4 cup Basil Vinaigrette in a large zip-top plastic bag; seal and chill 15 minutes, turning occasionally. 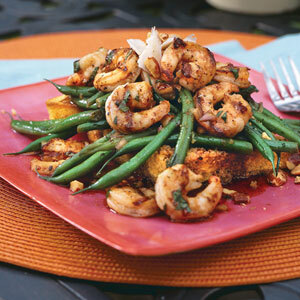 Remove shrimp from marinade, discarding marinade. Thread shrimp onto skewers. Grill, covered with grill lid, over medium-high heat (350° to 400°) 2 minutes on each side or just until shrimp turn pink. Remove shrimp from skewers; toss with green beans, bacon, Parmesan cheese, almonds, and remaining 3/4 cup Basil Vinaigrette. Serve over hot cornbread, if desired. Turning your Large Zucchini into Apple Pie! It's time for Zapple Pie! My 13 year old has been waiting oh-so-patiently for me to make her favorite 'vegetable' pie... one that actually is mistaken for a fruit pie. Apple Pie. But that's ok, because it's supposed to be! It's Zapple Pie - made with zucchini and it's so good that you could probably bake in bulk and sell them! Unfortunately work has kept me at the office until 7:pm a few nights this week and coupled with errands, meant sometimes not getting home until 9:00 and thus; no pie. But it's the weekend, with no plans in place, a husband working and kids otherwise occupied, so guess what she finally got? Zapple Pie! And now you can too! Grab those zucchini's that you have sitting on the counter that you've run out of idea's to make things with, and get ready to serve your family apple pie... errr, make that Zapple Pie. Maybe it's just me, or maybe others feel like I do, but I hate any smoothie that includes dairy products. The second you add yogurt, milk or any other 'cream' to my smoothie, I would have a hard time drinking it. I like my smoothies to be fruit and well... fruit. Through trial and error I discovered that my all time favorite smoothie 'recipes' are really a lot of fruit and little else besides water or once in a while, a fruit juice. The trick? Frozen! For the easiest ever Mango smoothie (something I crave and can drink 3 in one sitting!) 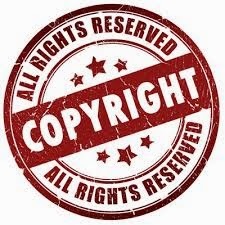 is either use fresh mangoes you have peeled and diced and frozen or purchase a bag of frozen mango in your frozen foods section of the grocery store. Place in a blender and add enough water or fruit juice to help the blending process. Add more liquid if it gets too thick. Blend until smooth and serve in a tall glass with both a spoon and straw. Some people like to top it with whipped cream (my Mom likes this on her peach smoothies) but me? Keep all dairy products away and give me the fruit! Earlier this week I was excited to post the recipe for Souvlaki (below) and had been craving it myself so I made plans to serve it. Due to our families crazy schedules however I had a hard time finding an evening when I got home before 8:00 or 9:00 pm and/or when at least 2 or 3 other members of the family were home over the dinner hour as well. My 16 year old was on vacation with a friends' family, my 18 year old was working, my husband was working or I was running errands, attending mass, working late or similar. But I did finally get to make my Souvlaki. I started with the basic recipe (posted below)but added about 1 T garlic to the chicken marinade. Then, due to the crazy aforementioned scheduled, I ended up marinating it for over 24 hours. I would do it again though as I like flavor to be infused throughout my grilled chicken. When it came to vegetables I decided to use some of the garden harvest filling my counters this weekend. Zucchini, green peppers and onions made a delightful mixture. I drizzled them with olive oil and sprinkled them with fresh cracked black pepper and sea salt. Ready to grill... marinated chicken for the Souvlaki and skewers with zucchini, onion and green peppers. Chicken Souvlaki or "Grilled Chicken on Pita's with a creamy cucumber sauce"
Souvlaki. Growing up in the heartland of the Midwest I can guarantee that I never once heard this dish uttered not only in my own household, but my friends, extended family or even saw it in any of the cookbooks that I surrounded myself with. Now, a couple decades later it very well has made it's way to the bread basket of America and small town life. It's even served at local county fairs... but you probably haven't heard it called Souvlaki. If I asked you if you've had it you might say 'no'. If I ask you if you've had grilled chicken on pita bread with tomatoes, onions, and a cool yogurt and cucumber sauce you might say "Oh! Yes I've made that!" or "I just had that at the local fair last week!" We are possibly having guests from out of town both Wednesday night and Sunday. If the sunshine holds out and the weather is perfect for grilling this is going to be a delicious summer meal to serve with a glass of wine or even a non-alcoholic raspberry or cranberry drink. First make the delicious cucumber/yogurt sauce; Put the yogurt in a strainer lined with cheesecloth or a paper coffee filter and set it over a bowl. Let drain in the refrigerator for 15 minutes. In a medium glass or stainless-steel bowl, combine the cucumber with 1 teaspoon of the salt; let sit for about 15 minutes. Squeeze the cucumber to remove the liquid. Put the cucumber back in the bowl and stir in the drained yogurt, the garlic, 1/8 teaspoon of pepper, and the dill. In a small bowl, combine the oil, lemon juice, oregano, the remaining 1/4 teaspoon of salt, and 1/4 teaspoon of pepper. Toss the chicken cubes in the oil mixture and thread them onto wooden skewers you have soaked in water or on metal skewers. Grill the chicken over high heat, turning once, until done, about 5 minutes. Transfer the chicken to a plate. Spread both sides of the pitas with the butter and grill or broil just a couple minutes,turning once, until golden. To serve, put the pitas on plates and top with the onion, tomatoes, and chicken skewers with any accumulated juices. Serve with the tzatziki and olives. Although I use a number of chocolate cake recipes I'm always keeping my eye out for more. I can't count the number of recipes I have in my files, books, hand written notebooks and magazines, but I wanted to add this one to my online collection so it never gets lost. It's a very simple recipe but the lighter-than-air texture comes from the dozen (yes, 12~) eggs whites! This is special for the bittersweet chocolate and dozen egg whites but it's worth making. Preheat oven to 350°F. Grease four 9-inch circular cake pans and line bottoms of circles with a piece of parchment paper. Melt chocolate with water in a small heavy saucepan over very low heat, stirring. Cool to lukewarm.In your stand mixer, beat yolks, 2/3 cup sugar, and salt until thick and pale for about 5 minutes. Stir in melted chocolate until combined. In a separate extra large bowl, beat 12 egg whites until they hold stiff peaks. Add remaining sugar and beat until whites just hold stiff peaks. Fold one third of whites into melted-chocolate mixture, then fold in remaining whites carefully. Spread batter evenly over four baking pans. Bake until the cake has puffed and the top is dry to the touch, maybe 16 minutes. Cool the cake pans on cooling racks for about 10 minutes. Place a piece of waxed paper over the top of the cake pans. Place a cookie sheet over paper and invert cake onto it, gently peeling off wax paper lining. For best results, place all of the layers in the freezer for at least 2 hours or until they are firm enough to be carefully lifted without breaking. In order to make the filling: In a clean large bowl, beat cream with powdered sugar, cocoa powder and vanilla. Bring first cake layer out of the freezer, arrange on your cake plate, cocoa side down. Spread 1/4 of filling evenly over the cake layer. Bring the next cake layer out of the freezer, placing it gently over the filling, again cocoa side down. Repeat until the cake is assembled. Keep cake in the refrigerator until serving time. The cake layers should thaw after about 2-3 hours of being in the refrigerator and the cake will be ready to serve. With three teenagers I spend a bit of time 'waiting'. Sometimes in dentist offices, doctor's offices and sports practices. Other times I find myself waiting at car dealerships, mechanic's shops and lines. Thankfully most offices have magazines, and also just as thankfully, I almost always have my camera. 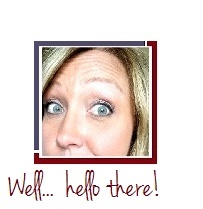 It's a win-win situation when I come across recipes, cute craft ideas and household hints and helps. This particular photo file is stored in my personal files as a 'brain-tickler' as sometimes you don't actually need a recipe or instructions, but simply need to see something 'again' to remember it and use it as a base to draw upon in your own home. For this beautiful and simple table decoration item, or even a personal 'name' card for a dinner party, use an egg! Carefully tap out and remove a small portion at the top of the egg and remove the contents (which you can use in omlets, cakes or desserts!) and then gently wash and rinse. Add a bit of potting soil and a small plant or even seed if you have time to grow it before your celebration and in the end, delight in a beautiful and simple 'green' gift that can be replanted if the recipient wishes. Beautiful and simple decorations for cakes, cookies, desserts and more, they are oh-so-simple to make and yet not many people do. While everyone has probably seen or made the sandbox or beach pail cakes by now with pudding and crushed graham crackers, here is another version I found, similar but different. Perfect for a beach themed party, a summer cook out or if you are lucky enough to live near the ocean... any time! 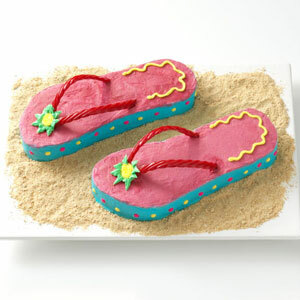 Make it a Flip Flop Cake! Line a 13-in. x 9-in. baking pan with waxed paper and grease the paper; set aside. Prepare cake mix according to package directions. Pour batter into prepared pan. Bake according to package directions. Cool for 10 minutes before removing from pan to a wire rack to cool completely. Trace flip-flop pattern onto waxed paper; cut out. (Re-size to whatever size you want.) Arrange pattern over cake; with a sharp knife, cut out. Flip pattern and cut out a second flip-flop. Discard scraps. Transfer cakes to a covered cake board. For frosting, in a large bowl, combine confectioners' sugar and meringue powder. In the bowl of a heavy-duty stand mixer, combine the shortening, butter, milk and vanilla. Beat in sugar mixture. Tint 1 cup frosting pink; frost tops of cakes. Tint 1 cup frosting blue; frost sides of cakes. Insert licorice ends into cakes to form straps of flip-flops. Tint 1/4 cup frosting yellow. Using a #4 round tip, pipe decorative lines on top of shoes. Using a #17 star tip, pipe rosettes where straps meet. Tint remaining frosting green. Using a #352 leaf tip, pipe leaves around rosettes. To finish, press candy buttons into sides of cakes; sprinkle cracker crumbs on board to form sand. Store in the refrigerator.